At the cry of ‘There she blows!’ gangs of whalers took to the waters. Whale oil, baleen, ambergris and bone were valuable, but many men hunted whales for the thrill of the chase. Whaling was dangerous – harpooned whales thrashed and rolled, damaging boats or pulling them under. Whales were hunted for their oil, baleen and ambergris. The oil was used in lamps and machinery. Baleen hangs inside the whale's mouth to catch krill and other food, and was used to make corsets and whips. Ambergris forms in the whale’s belly and was an ingredient in expensive perfumes. Māori probably did not hunt whales before Europeans arrived. But if they found one washed up on a beach they would cut it up for food. The first whaling ship, from America, came to New Zealand waters in 1791. Over the next 10 years, the seas around New Zealand became a popular place to catch whales. There were plenty of them, and New Zealand provided safe waters and a place to stock up on food and wood. A lot of American and French whalers arrived in the 1830s. Ship whaling: the earliest whaling was done from ships. When the lookout spotted a whale from high up the mast, the boat would sail after it. The whalers fired a harpoon into the whale. The harpoon was attached to a long rope, and the whale would drag the vessel until it became exhausted. The harpoonist then speared it again to kill it. The whale was brought back to the ship to be cut up. 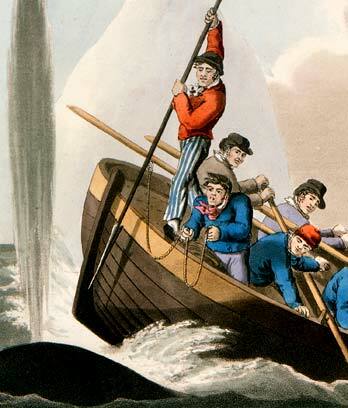 Shore whaling: when lookouts on shore saw a whale, gangs of men jumped into their boats and rowed out to it. They would harpoon the animal to kill it, and bring it back to shore. The blubber or fat was cut off the dead whale, then thrown into large metal pots and boiled down to make oil. Whalers were a tough group of men – they had to be, because the work was difficult. In New Zealand, many of the whalers were Māori. Hunting whales in New Zealand waters was made illegal in 1978. Today, people enjoy watching whales, rather than catching them.